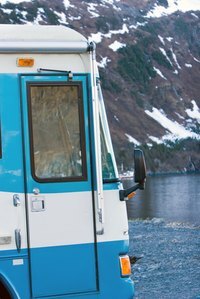 Many people use travel trailers for vacations while others live in them year-round. Either way, travel trailers need proper maintenance to extend their longevity. The siding is very important because it protects the trailer from the weather elements. Occasionally, extremely dented or damaged siding needs to be removed and replaced. You can remove the siding on your travel trailer without hiring a professional. Unscrew the top and side moldings from the trailer with a screwdriver, then pull the moldings down. Remove the clearance lights by popping off the lenses and unscrewing the screws with a screwdriver. Turn each light bulb 1/4-inch to the left to remove the light bulb's inner assembly. Remove the siding by gently pulling off the sheet from the trailer. Pry loose the top section of the sheet, and then use the needle-nose pliers to remove the staples holding the bottom of the sheet in place. Completely remove the entire sheet of siding and then repeat the steps for each additional sheet.